The coins that have value are those that are graded by the grading companies, so you must know and be able to differentiate between the graded and non-graded Mandela coins. The largest and most respected organisation of professional coin dealers is called PNG (Professional Numismatists Guild) and ICTA (Industry Council for Tangible Assets). They look over the coin market and make sure dealers around the world know about the differences in between grading companies.PNG releases surveys of the biggest grading companies. As you can see on the table produced by PNG, NGG and PCGS emerge as the top graders in the world. For this reason The Coin Company only deals with NGC and PCGS coins. All our Nelson Mandela Coins, Nelson Mandela 90th Birthday R5, 2000 Nelson Mandela Millennium R5 and 1994 Presidential Inauguration R5 are NGG or PCGS graded. BE AWARE!! Do not buy any coins that are not graded by PCGS or NGC. 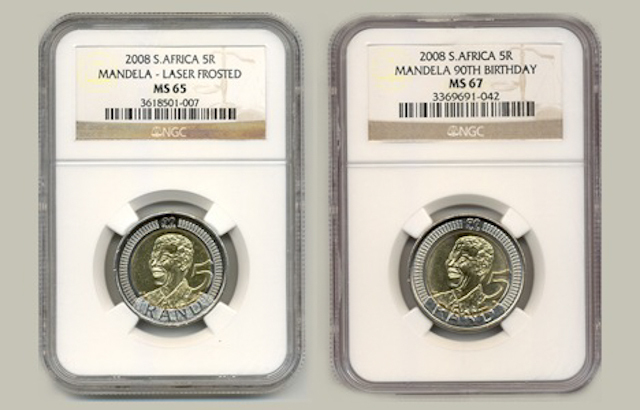 Nelson Mandela coins without grading have no other value than the one they represent. ANACS grading came into being as an arm of the American Numismatic Association, the world’s largest coin club. In 1990 after ANA sold its grading service to Amos Press of Sidney, Ohio, it ranked “average” in the PNG (Professional Numismatists Guild) and ICTA (Industry Council for Tangible Assets) report for grading accuracy. For this reason we don’t deal with ANACS coins.